I’ve finally got another bass guitar student! I teach so many weekly guitar drums and ukulele lessons but I haven’t had a bassist to teach in 2 years. This is an example of why bands find it so hard to find a bass player. 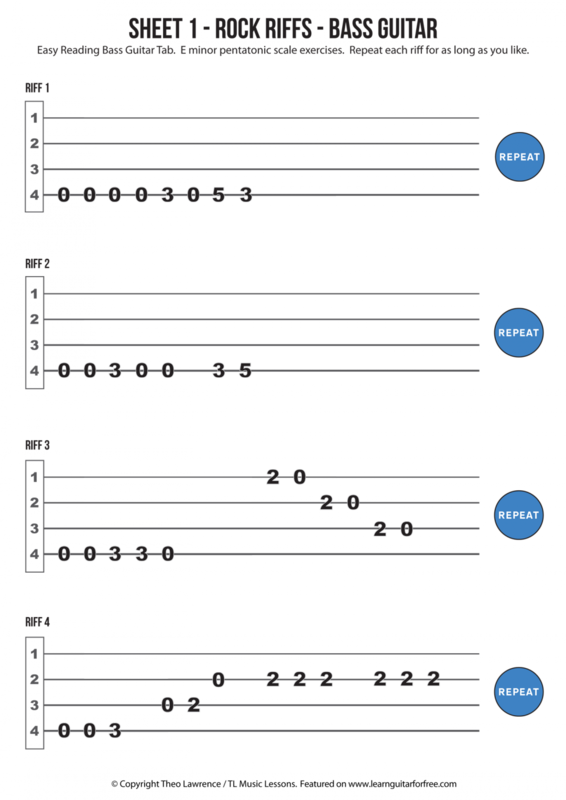 This new student is a complete beginner on bass so I’m rebooting some of my old bass guitar lesson prep ideas and applying it to the new ‘Easy Reading’ designs I have been making for guitar and ukulele, which have really helped with teaching beginners. Here is a sheet with 4 rock riffs for bass guitar. It uses notes from the E minor pentatonic scale. It’s all fairly easy and ideal for beginners. Keep repeating each exercise for a while and get into a groove before moving on. If you are really keen, try playing in time with a metronome. For many complete beginners though, it will be a matter of playing through each riff slowly. For the complete beginners, read from left to right and play each number as it comes up. So on Riff 3, the sequence would be 0 0 3 3 0… 2 0 2 0 2 0. The top line is the 1st string, and that’s the thinnest string on the bass. The strings are numbered 1-4 on the left hand side. Update, Jan 2019: I now have 3 bass students, which I’m really pleased about, so I hope to post more bass exercises soon on the website.